The patient severe form osteomalacia. Osteomalacia (synonym softening of bones) is a systemic disease characterized by the violation of mineral exchange with primary lesion of the bone tissue, consisting in softening and deformations of bones due to depletion of body salts of calcium, phosphorous acid and vitamins. When osteomalacia part of the bone is replaced osteodes cloth without further calcification. It causes unnecessary flexibility bone (Fig.). Osteomalacia is observed in women is about 10 times more often than men. Depending on the time of occurrence distinguish four forms osteomalacia: 1) children and youth, 2) puerperal, 3) climacteric, 4) senile. For children and young forms osteomalacia is typical primary defeat bones of the limbs. For menopausal and old forms osteomalacia characterized by loss of the vertebrae, causing kyphosis and shortening of the body (the impression of "sitting dwarf"). Senile osteomalacia there are multiple fractures, as the disease runs in the background of the General osteoporosis (see). One of the most frequent forms osteomalacia is puerperal osteomalacia observed in pregnant women aged 20-40 years, more often if you re pregnant, at least - after delivery during prolonged lactation. In this form osteomalacia affects the bones of the pelvis, the lower part of the spine, upper sections thighs. Patients complain of pain in the bones of the sacrum and pelvic, back, legs, especially when pressed. You receive a "duck" gait, can occur paresis, and paralysis. 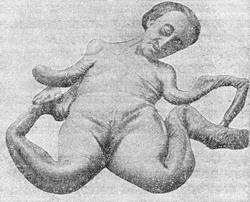 Deformation of the bones leads to the development of so-called osteomalacia pelvis, where childbirth is sometimes possible through the natural way. When calcification deformed pelvis delivery is not possible and necessary to resort to the operation caesarean section. Treatment. After childbirth often happens improvement of the patients with the disorder and even cure the disease. When osteomalacia during pregnancy appoint a high-grade food, rich in protein, phosphorus, salts of calcium, vitamins, and medications phosphorus and fish oil. When treatment failure is shown abortion, termination of breast feeding, castration. Forecast for life favorable, but patients become severe disabilities. Osteomalacia (osteomalacia; from the Greek. osteon - bone and malakia - softness; synonym softening of bones) is a systemic disease characterized by the violation of mineral exchange with primary lesion of the bone tissue, consisting in softening and deformations of bones due to depletion of body salts of calcium, phosphorous acid and vitamins. O. observed in women is approximately 10 times more often than men. children and youth form, or osteomalacia puberty (late rickets), puerperal, menopause, old age. Moreover occurs excretory form osteomalacia (renal osteodystrophy) with various chronic and progressive disease of the kidneys, mainly in the young age (congenital malformations, kidney disease, hydronephrosis, cystic kidney and chronic interstitial nephritis), accompanied by pathological secretion of calcium. The etiology and pathogenesis. Despite the large number of experimental, clinical and x-ray observations, causes osteomalacia is not very clear yet. Primary defeat of women of different forms of Acting and high therapeutic effect of removal of the ovaries in women, suffering from puerperal form of Acting, talking about the role of endocrine disorders, first of all ovarian, in the development of this disease. Alimentary a theory for the origin O. the leading role in the development of the disease takes social factors. The essence of this theory is that when insufficient and defective food weakened the body is deficient in salts of calcium, phosphorous acid and vitamins (mainly of vitamin D)necessary to build bone. Known cases osteomalacia in the so-called osteopathy hungry, occurring mainly in immunocompromised girls in puberty (youth form) and women in the period of involution (old form). In this form of the disease, the improvement of living conditions, good nutrition with the inclusion of the necessary salts and vitamins gives a good therapeutic effect. A great role in the process of assimilation of mineral salts and calcined bones plays vitamin D obtained in the body with food and formed in the skin under the influence of insolation. On the presence in the body depends on the flow of phosphorus from the blood stream into the bone tissue. Applying a similar diet for the treatment Acting in pregnant women (see Art. 1066) also leads to a favourable results. Confirmation of alimentary theory also serve statistical data that shows the growth of the disease Acting in pre-revolutionary Russia during the first world war and during the great Patriotic war. The dramatic improvement of living conditions in the USSR led to the disappearance of alimentary osteomalacia. Softening of bones is a complex biological process that cannot be explained by leaching lime from the well-formed bone structures. When Acting formed before the beginning of the disease of bone substance is more or less quickly destroyed ordinary osteoclastogenesis and replaced by new bone structure (osteodes cloth), it is not exposed to calcification or partially calcified. Common pathogenesis in rickets and O. gives a basis for the identification of these diseases. However, clinical and especially x-ray characterization of rickets and Acting allows to consider them as two distinct diseases. salt lime bone. Osteoid appears in cases where bone is formed in a lack of vitamin D. the Intensity of restructuring in different bones in the different departments of the same bones of various and depends on the physiological load a particular part of the skeleton. This explains the features of localization of osteoid in various forms O. When youth O. osteoid formed in the bones, the most intensively growing; senile - in the spine, which in old age rebuilt most intensively; when the pregnancy is in the bones of the pelvis (pelvic bones become soft deformed pelvis). Observed sometimes therapeutic success castration is explained not endocrine Genesis of Acting, and a sharp decline in the exchange after castration and, consequently, reducing the need for vitamin D (Century A. Rusakov). In severe forms of osteomalacia softened bones, twisted, at least About. they can give the most bizarre situation. When osteomalacia sometimes there are multiple accrete or non-Union fractures of the ribs (syndrome Milkmen). Bones are easily cut with a knife. Osteoid provided in the form of dense white masses. Microscopically osteoid poor osteocytes, forms a wide area around old calcified bone structures or chaotic accumulation (Fig. 1 and 2). O. men usually associated with kidney diseases (see Nephrogenic osteopathy). Fig. 1. Osteoid (light grey) on the old bone beams (dark gray). Fig. 2. Massive deposits of osteoid in spongiosa vertebra.